Comfortable and recent chalet with private sauna and Jacuzzi and Wifi. At your disposal a fully equipped kitchen open to a cozy dining room and a cozy living room with wood stove, 3 bedrooms, one on the ground floor, a sauna on the floor, a covered jacuzzi, 2 toilets, 2 bathrooms. baths including one with a hydro-massage shower. The cottage has all the equipment necessary for a pleasant stay (wifi, barbecue, deck chairs, garden furniture for the summer or raclette machine, DVD player ...). It is located on a plot of over 1000 m2 and is conveniently located to enjoy fishing and hiking. Less than 2 minutes from the biggest ski resort in the Vosges La Bresse HOHNECK. The bike park and adventure park nearby also guarantee you great sensations. Lake Gerardmer and many other mountain lakes are within a few km, you are cool in summer. Finally, Alsace (its cellars and Christmas markets) is nearby. THE PLUS OF THIS CHALET: its equipment (sauna, jacuzzi) and its location, the advice provided by the owner for the duration of your stay, the baby pack (cot, high chair, child bath, changing mat, bottle warmer ), a bus stop near the chalet to go to the ski resort and a hostel within 50 meters, a specialty of the region will be offered upon arrival. The chalet is equipped with two bathrooms with shower jet, one on the 1st floor (associated with SAUNA) and the second on the ground floor. WC on each floor. Parfait. Aucun reproche. Je recommande. Deuxième séjour en hiver dans ce chalet. Spacieux, très propre, bien équipé. 2 SdB, 2WC, 3 chambres, grand salon-salle à manger. Chauffage poêle à bois très efficace, super agréable. La cerise sur le gâteau: jacuzzi et sauna. Accueil du propriétaire très bien, très sympathique, souci de rendre notre séjour agréable. Autre point important, la proximité de la station La Bresse Hohneck (4 km), avec possibilité navette. Région très belle avec nombreuses visites possibles. Avons prévu d'y retourner l'année prochaine. Chalet très bien équipé et bien agencé. Accueil très agréable, merci pour la bouteille de bienvenue. Nous avons bien profité du jacuzzi. Nous recommandons fortement cette location. Idealer Standort zum Wandern oder Ski fahren sehr gut ausgestattetes Ferienhaus da fehlt es an nichts. Der Hausmeister ist direkt gegenüber und hat sehr liebevoll vorbereitetes Brennholz für den Kamin. Le chalet est spacieux et il ne manque rien. Nous avons été très bien accueillis et nous avons reçu toutes les réponses à nos questions ainsi que les informations pour mieux connaître la région et passer un séjour agréable. La région est vraiment très belle et nous avons pu profiter de magnifiques paysages lors de nos balades. Petits bémols : le bruit de la route et la qualité de la literie. 3ème année chez Mr Mougel. Toujours ravis ! Très bien accueillis, chalet très sympa (avec spa et sauna), très propre, proche des pistes, enfin que du +. 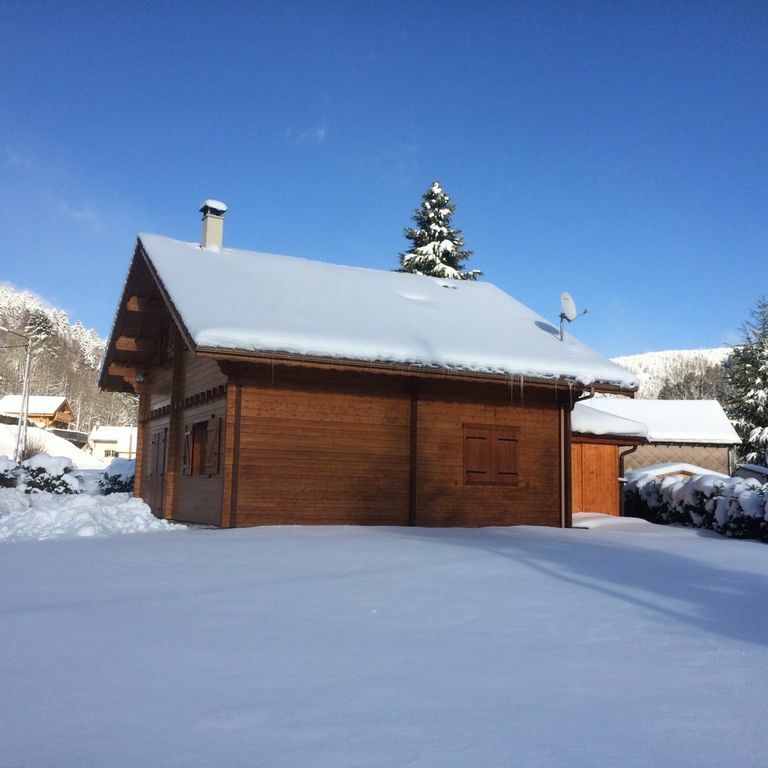 The chalet is located at 1:15 of Basel Airport, 2H Airport Nancy-Metz and less than 30 minutes from the TGV station at Remiremont. Paris is less than 5H road from La Bresse, at 1:30 Nancy, Metz and Strasbourg less than 2H, Luxembourg and Arlon (Belgium) less than 3H.